One of the characteristics observed in mutated p53 is the tendency to form amyloid aggregates, which are structures that no longer display the protein original 3D conformation, stick together, and are resistant to degradation. These amyloid aggregates build up in the tissue, are very harmful, and present a pathogen-like behavior where mutants highjack normal counterparts and convert them into the amyloid form. These aggregates have been found in many cancer patients and in other protein-misfolding diseases such as Alzheimer's and Parkinson's. "A clear understanding of all the changes that occur in the molecule before it assumes the amyloid state may allow us to manipulate this process and have the option of either rescuing the native state of the p53 protein or blocking its transformation into amyloid oligomers and fibrils," says Guilherme A. de Oliveira, one of the study's co-authors. 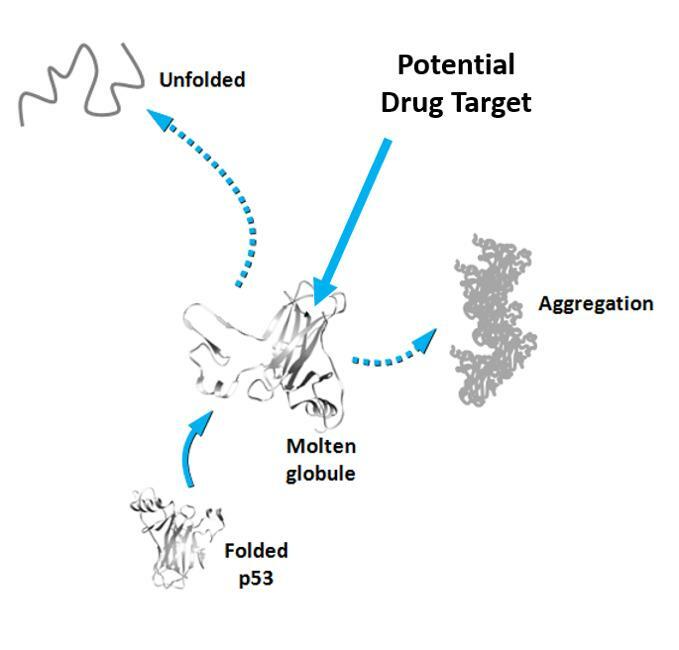 The paper entitled "Aggregation-primed molten globule conformers of the p53 core domain provide potential tools for studying p53C aggregation in cancer" is published online in The Journal of Biological Chemistry.